1461 East K St., Brawley, Calif. 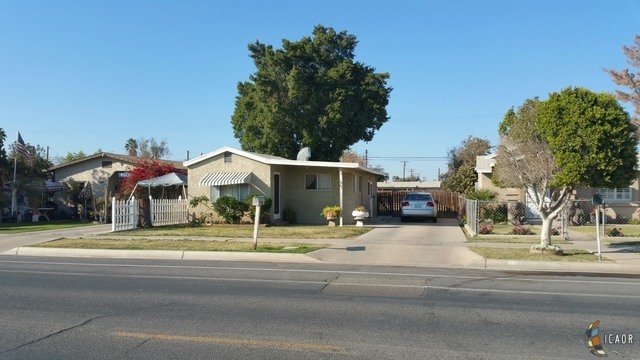 Cute Starter home or Investor fix and flip, 2 Bedroom, 1 bath, Living room, Kitchen/Dining combo, with Mudd room/Laundry room. Cosmetic Fixer. Close to Schools, Shopping and surrounding Cities of Imperial, El Centro and Calipatria. Large size back yard with alley access, with room for toys/boat. Possibility for 2nd unit. Seller makes no warranties except as to Title, seller will make no repairs, nor do termite. Buyer or agent to do their own due diligence to satisfy themselves. Property sold "As-Is". You own the land, no HOA&apos;s, New Air/Heat Air Conditioner and Stove.